The illicit love child of a fling between Manchester Rock and Kingston Dub, Australia’s Sticky Fingers has been luring in fans across the world with an irresistibly crafted blend of rock and reggae sonics. And their talents extend past scoring extended sun-soaked vacations. Having put together a high-voltage and seductive live show, the band has become a fan favorite, resulting in a sold-out world tour and appearances at renowned international festivals. For that is where Sticky Fingers’ larger-than-life music really shines–in the realm of life-changing live performances. 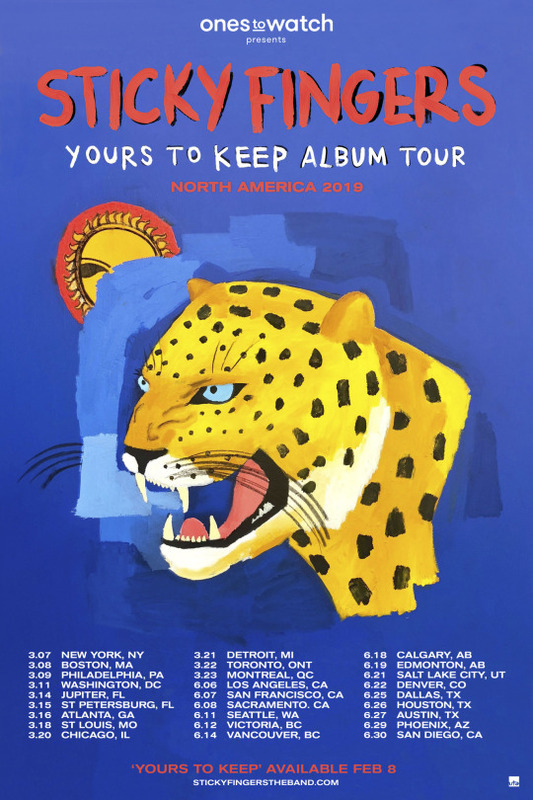 Now, set to return with their first studio album in over two years, the long-awaited and much-clamored for Yours To Keep, Sticky Fingers has announced they will be taking their new album across North America. Proudly presented by us here at Ones To Watch, we cannot adequately prepare ourselves for the raucous time that is about to be this Sticky Fingers tour. Catch you there. Tickets for Sticky Finger’s ‘Yours To Keep Album’ tour will be available Friday, Jan. 18, at 10:00 AM local time. Find your city below to grab your tickets!